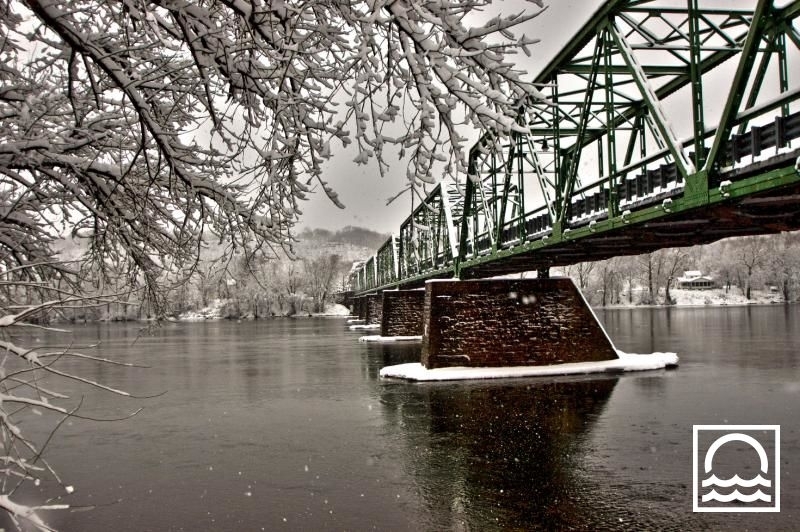 Karen Harmon's winning photo of the Frenchtown-Uhlerstown Bridge over the Delaware River. Sandy beach sunsets, rolling tree-covered hills, serene fishing scenes, and tall stately bridges – these were some of the entries in the “Beauty” contest for the Delaware River Means campaign. While many entries came in, Karen Harmon’s photo of the Delaware River at the Frenchtown-Uhlerstown Bridge won by a landslide with 533 votes. “I’m very excited, I’ve never won a contest before – or entered one,” Karen laughed. Karen lives in Frenchtown, New Jersey, just a short walk from the Delaware River and the Frenchtown-Uhlerstown Bridge. As Karen describes, the photo was taken during a perfect, snowy, and quiet evening, with no one else around – just her and the Delaware. Karen is an amateur photographer who has enjoyed the Delaware’s beauty since moving to the area in the early ‘90s and has made the River the subject of hundreds of her photographs. “It's just gorgeous... I love looking at it, I love playing in it,” Karen reflects. The way Karen is captured by the Delaware’s natural beauty makes it fitting that Karen would win the Delaware River Means Beauty contest. Karen Harmon received her prize for the "Beauty" contest next to the Delaware River from Mark Zakutansky, Director of Conservation Policy Engagement at the Appalachian Mountain Club. The Delaware River Means campaign wants to know “What does the Delaware River mean to you?” The answer to this is explored, as we wrote about previously, through four separate contests: Fun, Beauty, Togetherness, and History. This is how it works: enter your photo and story, share your entry on social media, and if your entry gets the most votes, you win a special prize for that contest. There are still two contests to go before the campaign ends: Togetherness and History. Winners of each of the four contests are also entered into a drawing for the grand prize of a stand-up paddle board. Karen explains that she shared her entry on social media every day, which helped her to rack up the votes – along with very supportive friends and family. “My Facebook friends look forward to my photographs and have really supported me in this contest,” says Karen. Another beautiful photo taken by Karen Harmon of the Delaware River in Frenchtown, NJ. For Karen, the Delaware River means having access to the beauty and wonder of the river in her own backyard. Speaking with her, it’s clear that her whole family has fun on the Delaware River. “We use the river a lot, it makes me smile,” says Karen. Her and her husband paddle down the River every year in a canoe, her dog loves splashing and playing in the River on every warm summer day, and every July her family and friends (sometimes up to 50 people!) tube down the Delaware. “We have a great time, we really do,” Karen adds, “I love that river.” Karen says she has also seen the health of the Delaware River improve since she moved to Frenchtown, stating that the shad run is more lively and the river seems cleaner. A foggy Frenchtown-Uhlerstown Bridge over the Delaware River taken by Karen Harmon. Karen’s winning prize was an original painting of the Delaware River by local artist Jessie Krause, who captures the magnificence of the Delaware in her breath-taking work. “For the past 10 years, the Delaware River has been a constant source of inspiration for me. As an artist, capturing the light on the river and the surrounding hills, trees, villages and bridges, is a challenge… The Delaware River - full of history, mystery, adventure and beauty - is a gift to all who experience her,” says Jessie. The Delaware River is a source of fun, beauty, togetherness, and history for those within the watershed and beyond. You can now enter your photo and story to the Delaware River Means “Togetherness” contest and voting has also officially begun. Your photo and story about how the Delaware River Watershed has brought people together could you win a Marmot Halo tent (pictured below). This tent holds up to 6 people and is perfect for families, friends, and anyone who wants to spend some time together in the great outdoors. Keep the spirit of togetherness alive by sharing your memories on www.DelawareRiverMeans.com. All entries in the Togetherness contest will also be entered to win the grand prize: a stand-up paddleboard package! The DRM Togetherness contest prize: a Marmot Halo tent. As the weather is getting warmer, now is the time to get outdoors and enjoy all that the Delaware River has to offer. And be sure to wave at Karen’s float when you see it traveling down the Delaware River this July.